"Your Community's Year Round Event Facility"
The necessity of an Agricultural Society was recognized early in the development of the Town of Paris by the Town’s founder Hiram Capron. He supported the September 23, 1858 first Paris Fair as an encouragement for community members to get together and to visualize the trends of the times. The Fair is constantly changing as the Agricultural sector evolves but never strays from the commitment to bring entertainment and agricultural education to the community. The Paris Agricultural Society has been the private owner and operator of the Paris Fairgrounds since 1923. Over the years, numerous permanent buildings have been erected on the property. These buildings showcase Fair exhibits such as livestock and poultry, Homecraft items, Photography, Fruits and Vegetables and many more attractions. 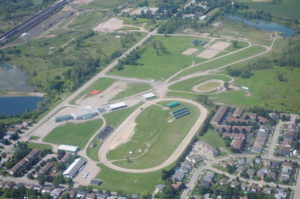 The facilities are also used year-round for numerous trade shows, weddings and family celebrations and community fundraising events and meetings. The accessible parking and large open areas are ideal for outdoor events as well such motorcycle races on the track, equestrian camps and competitions and music and art festivals. The Paris Agricultural Society is a proud member of the following organizations: Ontario Association of Agricultural Societies, Canadian Association of Fairs and Exhibitions, Paris and District Chamber of Commerce, International Association of Fairs and Expositions and is recognized as one of the Top 100 Events by Festivals and Events Ontario. The Paris Agricultural Society’s mission is to promote and conserve agriculture throughout the County of Brant and surrounding areas through our annual fair and provide facilities to enrich the health and education of the community as a whole. Our vision is to have a solid volunteer base that provides a fiscally viable, environmentally friendly year-round event facility that will continue to engage, educate and promote agricultural awareness in the community.